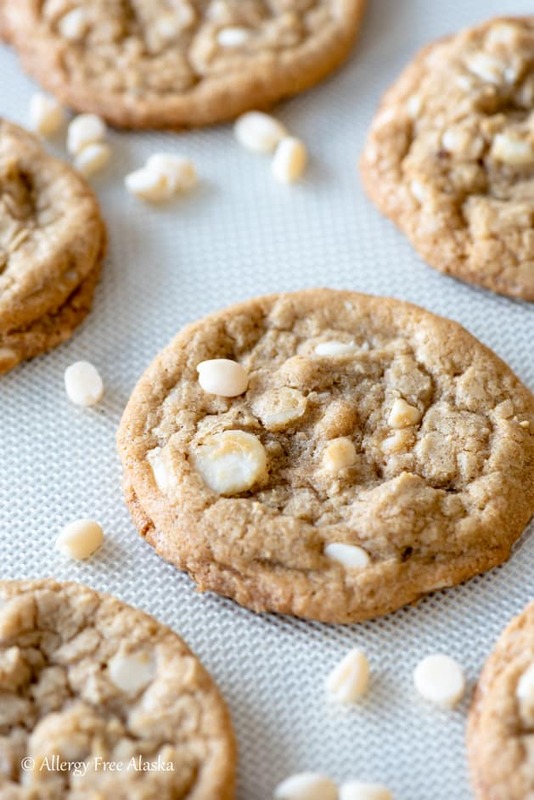 These Gluten Free White Chocolate Macadamia Nut Cookies melt in your mouth. They are rich and decadent, dairy free, and are crisp on the outside and soft on the inside. He especially loves my Gluten Free Sugar Cookies and my Gluten Free Mocha Hazelnut Cookies. If your dry roasted macadamia nuts are salted, reduce the amount of salt used in the recipe to 1/4 teaspoon vs. 1/2 teaspoon. I was unable to find unsalted macadamia nuts in my area, so that also may be the case where you live. I do prefer the texture of the cookies after about an hour of chilling in the refrigerator- but, don’t lose track of time and accidentally leave them in the refrigerator overnight. With many gluten free cookie recipes, gluten free cookie dough has a tendency to dry up and become crumbly if it sits overnight (yes, even in the refrigerator in an air-locked container). 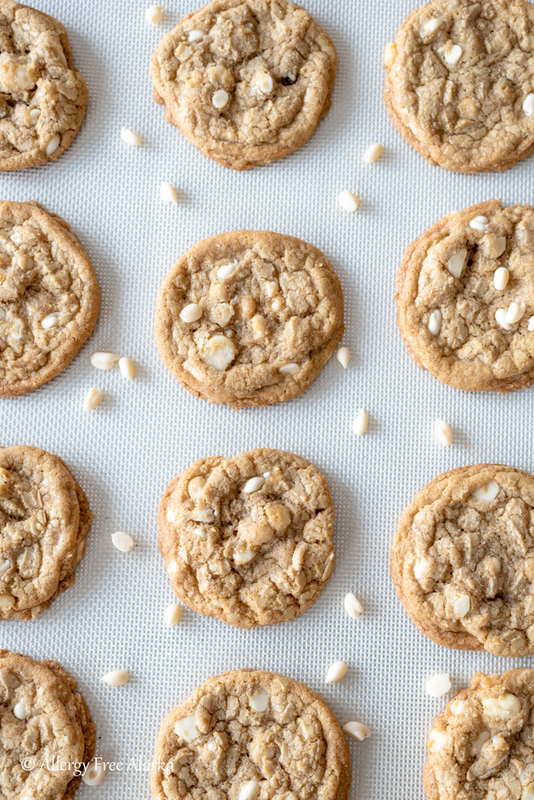 If you like super crispy cookies, bake these until they are totally golden brown. If you like crispy edges and a tender soft inside, bake until just the outer edges are just golden. Dairy free white chocolate, say what?!! I use the King David brand of non-dairy vegan white chocolate chips, however, I just want to caution you, they may contain traces of gluten and nuts. They work for my girls and I (we do not have celiac disease), but they may not work for everyone. Please check the ingredients and allergen information and decide what’s best for you and your family. Pascha also has a rice free white chocolate chip, but as far as I can tell, they are out of stock everywhere online. Reports say they taste amazing, but don’t do well in baked goods. Just fyi. Palm Shortening– Vegan butter or regular butter will work just fine, too. Just don’t use coconut oil as a substitute. Coconut oil is much thinner in consistency than shortening or butter (vegan or non vegan butter) and will cause your cookies to spread unnaturally and be very thin. Organic Cane Sugar & Organic Brown Sugar- Non organic is also okay. Can you replace these sugars with coconut sugar? I would not recommend it in this specific recipe. Cane sugar (both white and brown) offers a certain lightness and crispness to the cookie dough that coconut sugar won’t. I am a huge fan of coconut sugar; it’s just not the right sweetener for this recipe. Eggs– I have not made this recipe without eggs, so I’m not 100% positive an egg substitute will work. 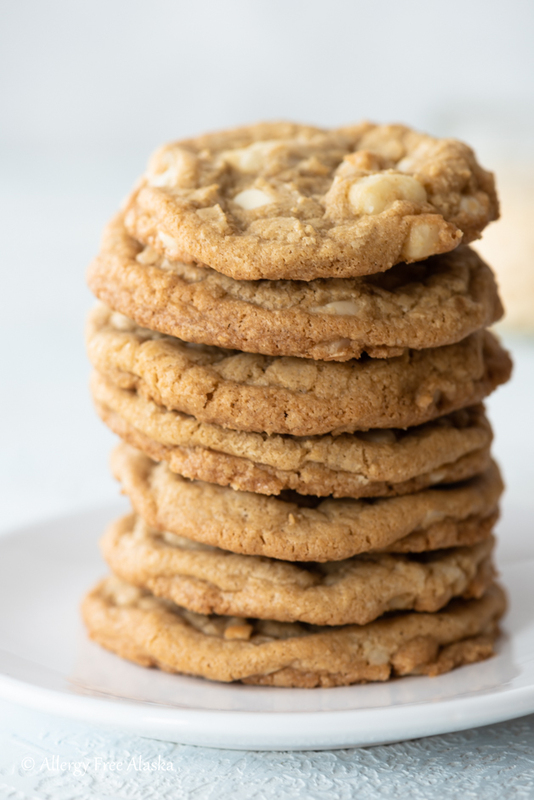 Almond Extract– Very little is used in this recipe, but it adds such a wonderful flavor to the cookie dough that marries well with the white chocolate and the macadamia nuts. 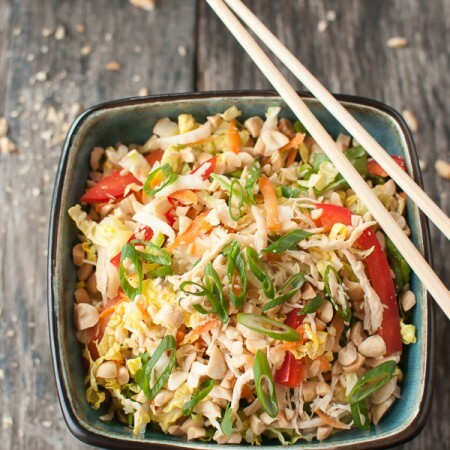 Even if you aren’t a fan of almond extract, I still encourage you to try it in this recipe. To me, the recipe wouldn’t be the same without it! Xanthan Gum– If you don’t tolerate xanthan gum well, you might be able to substitute guar gum in its place. 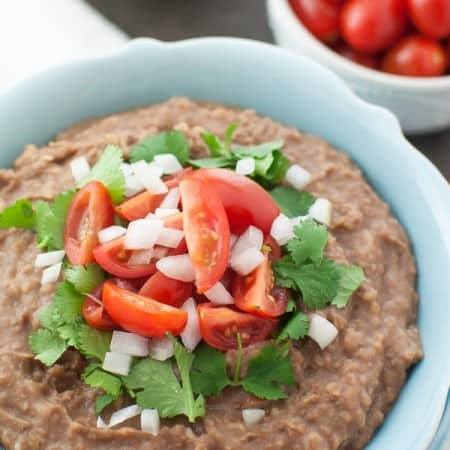 Millet Flour, Sorghum Flour & Tapioca Starch– Can I use a gluten free all purpose flour blend in place of these flours? That’s a great question! You can certainly try using a high quality blend, just know the only gluten free flours I’ve tested in this recipe are the ones I currently call for. I can’t guarantee the results if you use anything else. FYI, if you do use an all purpose blend, check to see if it already contains xanthan gum. If it does, you do not need to add the 1-teaspoon I call for in the recipe. 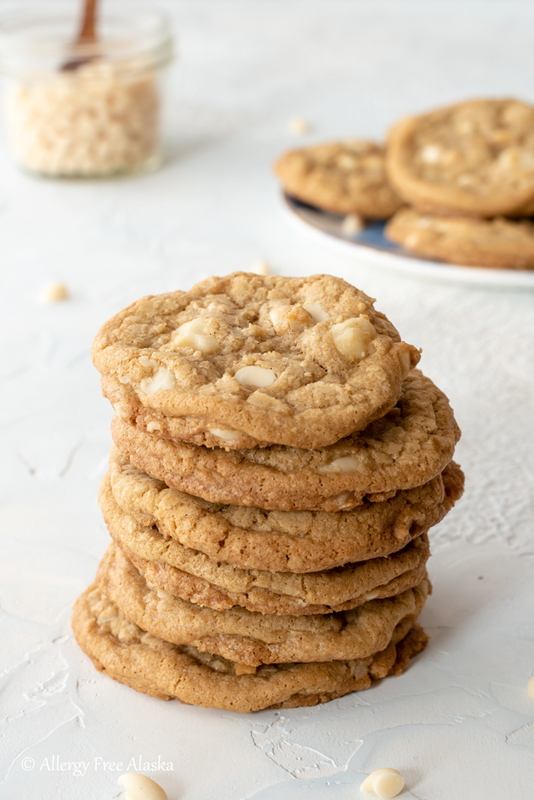 Prior to going gluten free, did you ever have the Subway white chocolate macadamia nut cookies? When I worked there in my teens, I fell absolutely in love with them (they were so delicious!). I knew I wanted to make this cookie recipe to be similar to what I remembered those Subway cookies tasting like. Did you make this recipe? Make sure you give it an honest review below and tag me on Instagram @allergyfreeak and #allergyfreealaska. 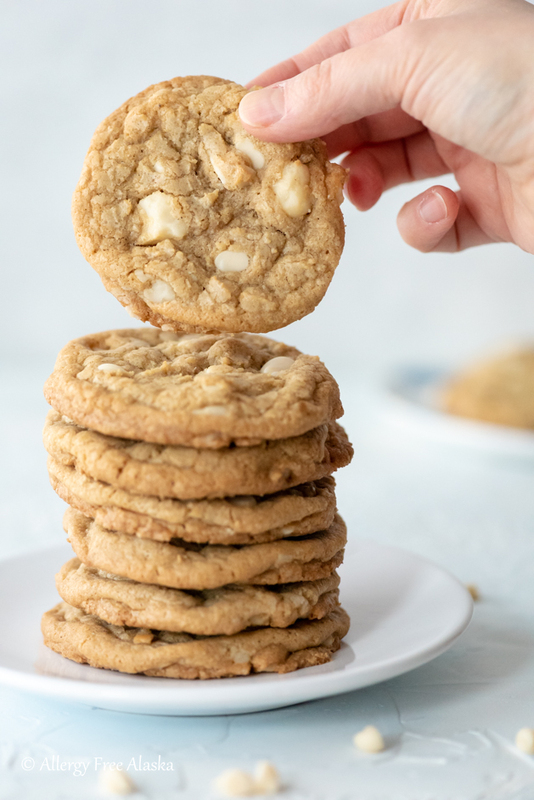 These Gluten Free White Chocolate Macadamia Nut Cookies are so rich and decadent, they melt right in your mouth! In the bowl of an electric mixer, cream together the palm shortening, organic cane sugar, and organic brown sugar for about 2 minutes on medium-high. Stir in the vanilla and the almond extracts. In a medium sized mixing bowl, combine the sea salt, baking soda, xanthan gum, millet flour, sorghum flour and tapioca starch. Gradually add the flour mixture into the wet ingredients, and stir until combined. 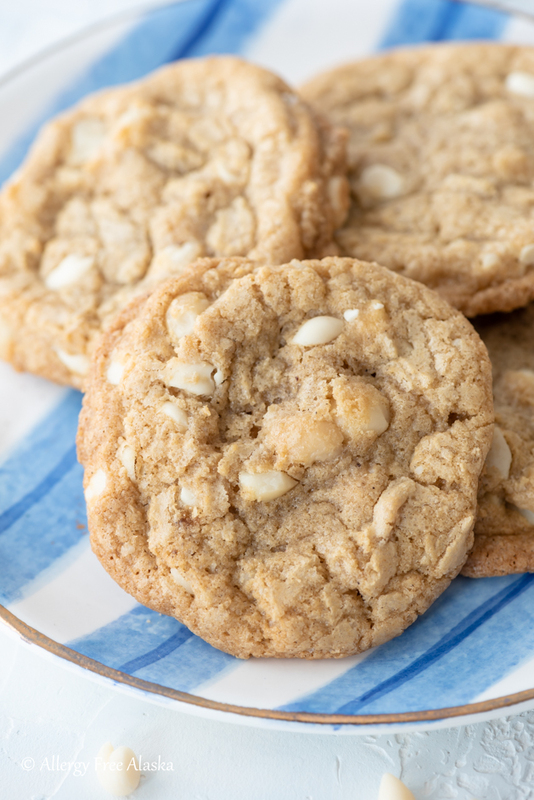 Mix in the macadamia nuts and the dairy-free white chocolate chips. Preheat oven to 350 degrees (F) and line 2 large baking sheets with silicone liners or parchment paper. Drop dough by tablespoonful onto the prepared baking sheets, leaving space between the dough for it to spread. Bake for 9-12 minutes, or until cookies are golden brown. If your dry roasted macadamia nuts are also salted, reduce the amount of salt used in the recipe to 1/4 teaspoon. I was unable to find unsalted macadamias in my area, so that also may be the case where you live. If you like super crispy cookies, bake these until they are totally golden brown. 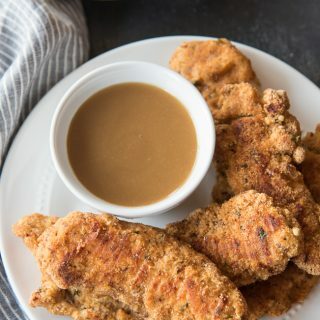 If you like crispy edges and a tender soft inside, bake until just the outer edges are golden. Who will you make these delicious cookies for? These cookies look crazy delicious! I need to make a batch soon! These really look tasty. I don’t eat GF but some family members do. There are so many allergies I don’t cook much for them any more. These cookies look fantastic! 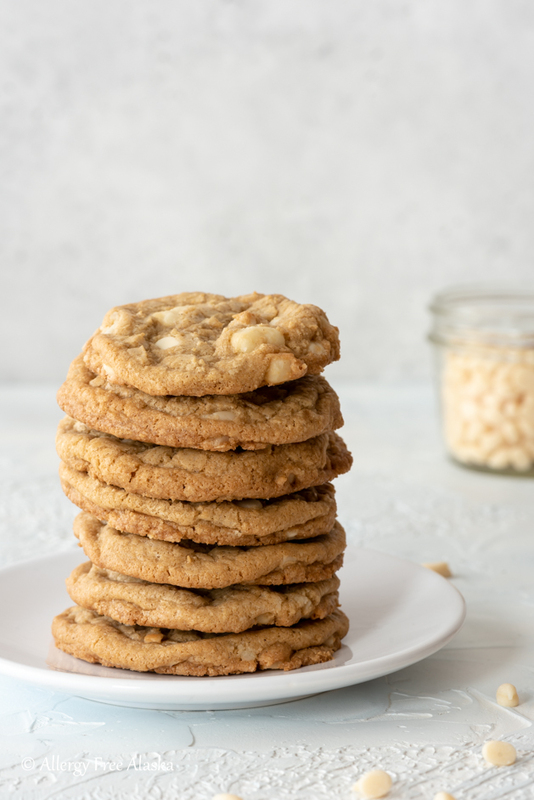 I need to get a hold of those white chocolate chips for my dairy free family member and make these!! Yes, you do, Lora! I know they would love them! Looks so yummy! I’m sure this will quickly disappear on the table, need to make a batch of these! They go so quickly! Thanks Melanie! Wow – you’re fast, Chrissie! I’m so happy to hear he enjoyed them!